Loopmasters present Culprate Great Expedition, a fantastical journey into electronic sounds to delight your mind and to quite literally tear up the sound system. Taken directly from Culprate?s Great Expedition EP, these sounds are 100% Royalty Free to use in your music and available in this form for the first time! Having established releases on some serious record labels Culprate has been steadily making waves across the underground music scene, his attention to detail is second to none and indeed there are not many producers who can get away with filling the audio spectrum of a production and still retain the clarity and punch of cinematic proportions. Cuplrate Great Expedition brings you over 1GB of content taken from his EP of the same name. As with all Culprate releases, you can be sure of bowl-emptying Bass, articulate Percussion, razor-sharp Tops and brain-haemorrhaging Drums. In total 144 Loops are included with filthy Basslines, devastating Drums and melodic Musical Loops, you?ll hear the sound of the Hammond Organ, Guitars, Synths, Pads and Retro Arps. Great Expedition also comes with 357 One Hits which Culprate has included for your production pleasure! With Atmospheres, Basses, Drums FX\and Synths to trigger and sequence in your DAW, as well as over 70 Sampler Patches to trigger them from. 10 Multi Sampled Instruments are also included, putting the disgusting Bass and lazer-guided Synths in the palm of your studio hands. At tempos from 125 to 140 BPM, Culprate Great Expedition is ideal for Dub Step, Trap, EDM, Techno and House. As usual, all melodic content is key labelled for immediate integration in your tracks. In detail expect to find 1.08 GB of content with 501 individual 24 Bit WAV files. 144 Loops are included with 41 Bass Loops, 30 Synth Loops and 73 Drum Loops [30 Full Drums, 20 Percussion Loops and 23 Top Loops. 357 One Hit samples are included with 9 Atmospheres , 22 Bass hits, 5 Multi Sampled Basses [104 Samples], 57 Drum Hits [19 Claps /Snares, 11 Hats/Cymbals, 13 Kicks and 14 Percussions],43 FX Hits, 20 Synth Hits, 5 Synth Multi Sampled Synths [85 Samples] and 17 Vocal hits. 149 Rex2 Loops and 77 Sampler Patches are also included for NNXT, Halion, EXS24, Kontakt and SFZ. 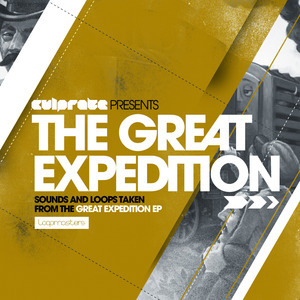 Culprate Great Expedition is an eclectic assault on the ears which will help you devastate dancefloors all over the world!